Saint Louis celebrated as soon as the clock hit 0:00. Photo by Jason Schott. 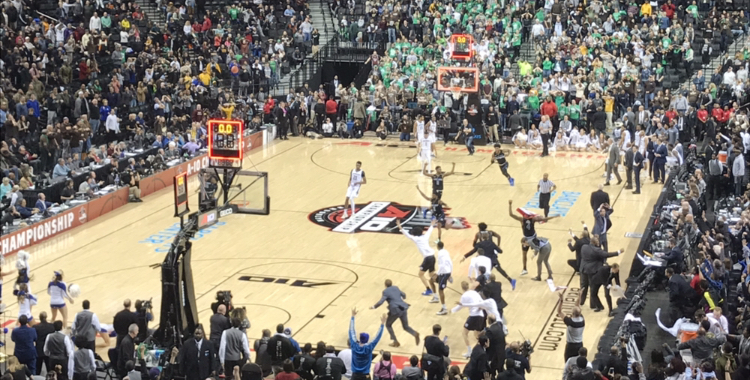 The Saint Louis Billikens won the Atlantic 10 Conference Championship on Sunday afternoon at Barclays Center with a 55-53 win over St. Bonaventure. This completed a run of four wins in four days for Saint Louis. The sixth-seed knocked off #11 Richmond, 71-68, on Thursday night, #3 Dayton, 64-55, on Friday night, #2 Davidson, 67-44, on Saturday night, and finally, #4 St. Bonaventure. This is the Billikens' first Atlantic 10 tournament title since 2013, the first time it was held at Barclays Center. They beat VCU, which was coached by Shaka Smart, in the championship game that year. Saint Louis was led by Jordan Goodwin, who had a double-double with 16 points (7-5 shooting, 1-5 three-pointers), with 14 rebounds, 3 assists, 3 blocks, and 2 steals. Javon Bess had 11 points (4-14 FG), 8 rebounds, and 3 assists. Hasahn French had 8 points (4-8 FG) and 7 rebounds. Saint Bonaventure was led by Courtney Stockard, who had 11 points on 7-12 shooting, including 6-9 on three-pointers, with 5 rebounds and 3 assists. LaDarien Griffin had a double-double with 10 points (5-13 FG) and 11 rebounds. Saint Louis overcame a 9-point deficit at the half, and outscored the Bonnies 30-19 in the second half to pull off the victory. As they did in the prior three games, the Billikens turned up the defense in the second half, holding the Bonnies to just 26.1 percent shooting (6-23). SLU shot 48.1 percent in the second half. St. Bonaventure was ahead 41-33 in the opening minutes of the second half when the game began to turn. St. Louis went on a 7-0 run capped by a Dion Wiley three-pointer to cut it to one at the 11:05 mark. After Courtney Stockard drained a three to end the six-minute scoring drought for the Bonnies, Saint Louis reeled off a 14-2 run (21-5 elongated run) to open up an eight-point lead, 54-46 on a Hasahn French layup with 3:45 remaining. Stockard followed with a layup at 3:13 to make it 54-48 SLU, and it stayed that way until the 1:16 mark when St. Bonaventure's Osun Osunniyi drained a pair of free throws to make it 54-50. On the ensuing inbounds pass, SLU's Tramaine Isabell, Jr., turned it over, giving the ball right back to the Bonnies at the 1:14 mark. LaDarien Griffin went for a layup and was hounded by two Saint Louis defenders, and he ended up traveling it as he tried to time his jumps around their leaps. Fred Thatch. Jr. was fouled on the inbounds at 1:08, and he drained one of two free throws to end Saint Louis' scoring drought of 2:47. Stockard responded with a three to pull the Bonnies within two, but then on the inbounds pass, he reached in (before he pulled his hands back) and fouled Javon Bess, sending him to the line for a one-and-one. Stockard exited with 22 points, taking the Bonnies' main scoring threat off the floor. Bess missed his first free throw attempt, giving the ball right back to the Bonnies, Dominick Welch missed a three-pointer with 31 seconds left, and they got the rebound. They got it to Kyle Lofton, who missed a layup at 16 seconds. 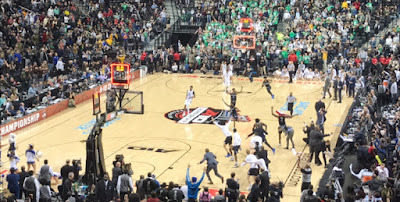 St. Bonaventure got the rebound, giving them the final shot, which was taken by Nelson Kaputo, who launched a three-point attempt from the corner that rimmed out, and the celebration was on for the Billikens. Saint Louis Head Coach Travis Ford said after the victory, "First off, just we have a lot of respect for St. Bonaventure and (Head Coach) Mark Schmidt, and what a great, great job he's done this season with his team, and what a championship game. What a competitive game. You just saw some guys, both teams, really, really competing, very much competing. "You know, we've -- in the tournament, we came back in the first game. The other two games, we were right there. We haven't really dug our defense too big a hole or been down -- I guess we didn't get the lead until late or the middle of the second half. So I was proud of our guys. "You know, I knew, I thought we made a few adjustments and talked about a few things at halftime. I was just hoping with he had enough in our tank. I'm thinking, we've played three games, they have only played two and we're the team that's going to have to make this comeback. We're going to have to dig, dig deep, and these guys were amazing. They dug deep. They found something and just said, we're going to refuse to give into this. "We kept talking about rebounding. Now, I really thought if we just changed the rebounding, things would go our way. Rebounding is an indicator for our team, it's an indicator, and it was not going the right direction for probably about 25 minutes. It wasn't in the right direction for us for how we need it, and then it switched. And I thought we went on a run that changed the game, and I thought we went from being the team on its heels to the team that was being the aggressor, and just really proud of how these guys finished the game. They just finished really, really strong, and to me, that's pretty impressive on these guys's parts for being their fourth game in four days. That's not easy to do." Tramaine Isabell, Jr., was named the Most Outstanding Player of the Tournament. He transferred to Saint Louis from Drexel and he spoke of that process, "I mean, a lot's transpired. The decision to leave Drexel was hard in itself. The coaches there have done a lot for me. Coach Fortier has known me since I was a kid. He coached at University of Washington. Coach Packer (ph), great coach, the entire staff, love them to death. "But Coach Ford told me I would be a part of something special, you know what I mean, and I believed him. I mean, just sitting here as the A-10 champion, I wouldn't change anything. I think here, I'm not asked to do as much. Like I said, I've got a guy sitting next to me that will go 16 points and four rebounds with six offensive rebounds, that's six -- what are you, three?" Isabell led the Billikens in scoring with 20 point-per-game and 6.3 assists-per game in the first three games of the tournament, and was held to 9 points (4-13 FG, 1-7 threes), 5 assists, and 2 steals on Sunday. On what was different about the Final compared to the first three games, Isabell said, " I think sometimes in a championship game like this, I think there's jitters. We messed up on -- well, I messed up on a couple things that I wouldn't necessarily mess up on. Like underneath, out-of-bounds, I think it was their first basket, I think they were struggling to score and they got an easy three in the corner. "When you have give teams momentum like that in a championship game, things can go either way, and I think that's what happened to them. We started getting on a run, the tide starts to shift and changes the game where everyone is so riled up, you never know what can happen; so you kind of want to see even keel and do what you do, you know, every day, which is not give up easy buckets. And if you start the game like that, then you're going to play offense, like, you know, pressing the pedal too much, doing too much. I think like Coach said, we just did the right things and ended up bringing the game out." Jordan Goodwin said of how the team handled playing four games in four days, "I do believe we are supposed to be here. I think we are a very good team. I've been a part of three teams, and we have tremendous athletes. "We have tremendous competitors from top to bottom, from coaches, you know, down to the managers. Everyone wants to win, no matter how much we're down. We're down 15 in a championship game, some guys might quit, you know what I mean. "I'm just happy to be here. I think we could have given it in. I don't remember how many games we lost straight in the conference, but you know, guys could have quit. I mean, some locker rooms might. But Coach just told us to keep pushing; we could do something special. I don't think we're done yet. I think we've still got a lot to prove." Goodwin said of playing this tournament in Brooklyn, "This experience is, like, I can't even compare it to any other thing I've been a part of. I think for me, having extra years under my belt and winning this, this year, is going to make me and my team like way better next year, because I know, and I learned a lot from Tramaine, still learning. Just watching him handle all type of ball screens and just being a playmaker. "When we've got guys like Javon Bess that lead with his work ethic and everything, he just make everything better and easy for us, and we got a lot of good freshmens this year. We got a good class next year. So this experience is just going to help this program go up." St. Bonaventure Head Coach Mark Schmidt said afterwards, "Yeah, I thought it was a great college game. I thought we played extremely well in the first half. You know, both offensively and defensively. We rebounded the ball well. The second half, give Saint Louis credit. They came after us. They are a very good halfcourt defensive team. They took away some of our actions and really made it a one-on-one game. "I thought going into the game, if someone was going to tell me we were going to hold them to 55 points and 57 percent from the field and 18 percent from threes, and we're going to out-rebound them by three, I thought we'd have a great chance of winning. And we did. You know, we had three shots at the end, two really good ones, I think, good looks that we missed. But give our guys credit. We were down, whatever, eight, with a couple minutes left and we have a chance to win the game. "So disappointing, but at the same time, you know, where we came from, it's pretty remarkable what these guys have done. But give Saint Louis credit. They played well. I thought Goodwin was terrific and to me, he was the difference. I thought we did a good job on Isabell, on Bess, but they got a lot of good players, well-coached, and we wish them luck."